I love Mexican food and could probably eat taco's every day. Not only is the food delicious, it is also affordable. There's one thing that I cannot go without when enjoying a Mexican Fiesta - Avocados. Here's a funny thing about me - Avocado's are my favorite fruit (did you know it was a fruit!?) but I didn't start eating them until 5 years ago. Now, I can put them on everything - I have even made chocolate covered Avocados! Avocado Chicken Taco's are my go-to choice. While Steak Taco's are my favorite, I am trying to eat more white meat. My biggest problem when making taco's is I tend to overstuff the shells, causing a huge mess. When Old El Paso came out with Taco Boats, my problems were solved. I can stuff as much or as little as I want into these soft shells and never have to worry about making a mess! This recipe was super simple and took less than 20 minutes to make. 1. Place your Chicken in a shallow pan with a lid. Cover with the cooking sauce and bring to a boil. Lower heat and allow to simmer for 15 minutes. 2. Shred Chicken in the pan by using 2 forks. Add 1 tablespoon of green chili's if using. Allow to simmer for 5 minutes or until the majority of the sauce has been absorbed. 3. 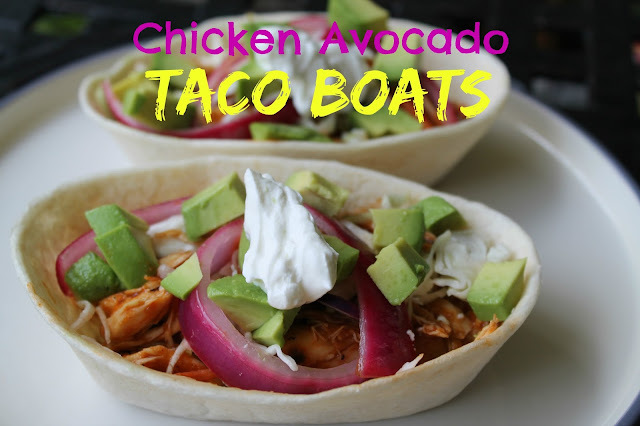 Build your taco boats using a variety of garnishes. Top with diced Avocado's and enjoy! You can save $1 on 3 items at Publix right now with this Coupon. All of the items I purchased came out to under $10 to feed a family of four. I want to make the delicious Beef Nachos recipe! I would love to make the Fish Tacos with Mango Salsa recipe. I would make corn quesadillas. I would cook the Creamy Chicken & Chile Enchiladas. I would love to try the Grilled Steak Fajita Boats. I know the whole family would love this one. I would make the bean and corn quesadillas. I would make the taco pizza rolls! Yum!! I will make Taco Pizza Rolls. I would make the fish tacos..they sound so good. I would make the White Chicken Enchilada Casserole. It looks delicious!